Check out these new, awesome shinig contact lenses! They are a definite must-have on every party. Your eyes will glow in the UV light and in the daylight they will give your eyes a fantastic, coloured look. Try now! 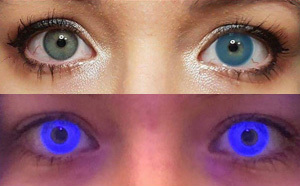 ColourVue Glow Blue contact lenses are an exceptional kind of crazy contacts - not only do they feature an amazing, bright blue color but they also glow in the UV light! With these shining contacts you will rule any club and wild party - just wear them in the UV light and look freaky with glowing eyes!